pronounced all you made as very good. as a blessing and a curse. to make some time for gratitude. a way to participate in your creation. the one-upmanship of cashmere woes. and not just hear it. with work that exercises our spiritual muscles. Work is where our faith gets a work out. We need your grace to love the guy in the inner office. We need your justice to know the next right thing to do. We need your mercy to love our neighbor as ourselves. we work in Your family business. May your will govern our work. May all we do be pleasing to you. We pray this in the Spirit who played at creation. Paulist Fr. Frank Desiderio is first consultor, or chief advisor, to the president of the Paulist Fathers. He also serves as director of the Paulist Associates and director of St. Mary’s of the Lake. Fr. Frank composed this prayer in late August, 2017. 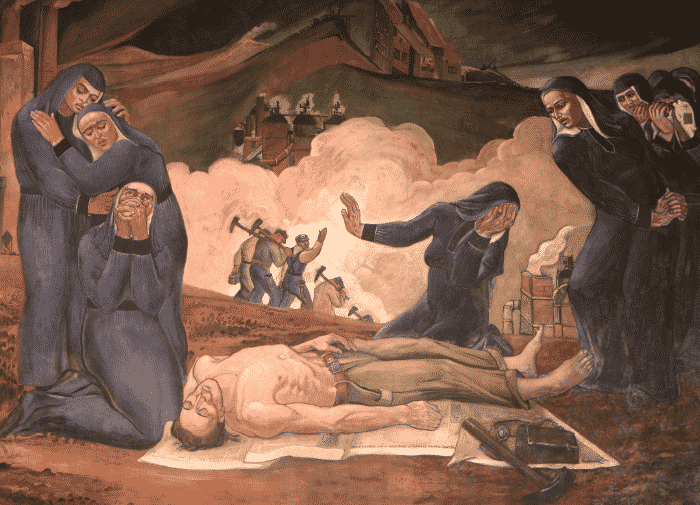 The image above shows “The Immigrant Mother Raises Her Son For Industry,” a mural by Maxo Vanka located at St. Nicholas Church in Millvale, PA.